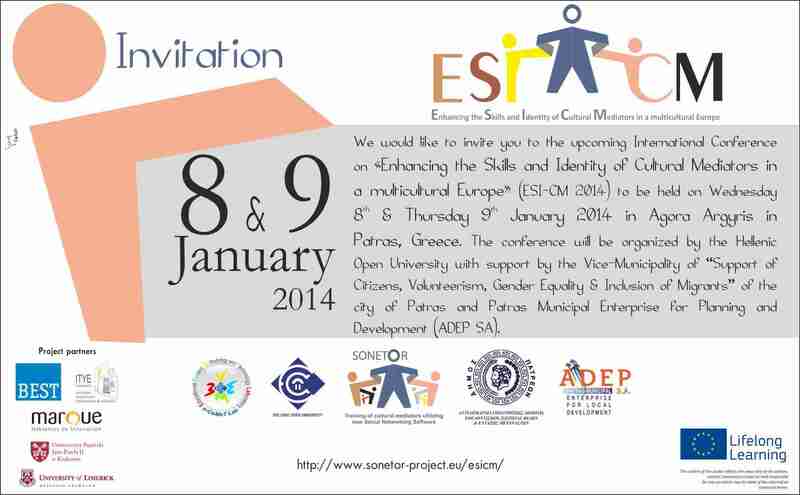 We cordially invite you to the International Conference on «Enhancing the skills and the identity of a Cultural Mediator in a multicultural Europe» (ESΙ-CM 2014), hosted by Hellenic Open University in Patras, Greece, on 8th – 9th January 2014 supported by the SONETOR project. The conference will include invited presentations by experts from academia, industry, and government as well as contributed presentations describing original work on the current state of research and ongoing activities in cultural mediation and related issues. What is a Cultural Mediator? Cultural Mediators are professionals who have been trained to facilitate the relations between migrants and citizens in the host country, aiming at the mutual exchange of knowledge and the establishment of positive relations between individuals of different cultural backgrounds and ethnic origins. The primary characteristics or skills of a Cultural Mediator main will include a good knowledge of the legislation, language, social structures such as health & education, as well as the culture and traditions of the host country and the migrants’ country of origin. They will also ideally possess good communication and active listening skills, and experience of negotiating and problem solving. Why is the Cultural Mediator’s role important? Over the last decades, migration has resulted in the demographic structures of many European countries changing significantly and has led to the emergence of multicultural societies in cities, towns and villages which up to recently were mono-culture up to very recently. As a result of these demographic changes, new needs in social service provision have arisen. One of these is cultural mediation, in other words the task of solving problems related to or arising from cultural or ethnical differences. More specifically, cultural mediation can be defined as the solving of cultural conflicts/issues/difficulties through communication and dialogue, and the development of common ground between different groups. The cultural mediator functions as the bridge between the culturally different groups and attempts to resolve issues before they become major problems. In essence, the cultural mediator provides services of interpretation and communication facilitation and mediation. In which way can I get myself become involved? 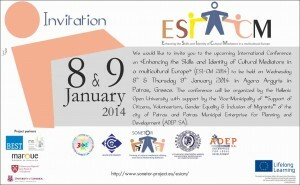 The SONETOR project, «Training of Cultural Mediators utilising new Social Networking Software», is a Development of Innovation LLP multilateral project which is funded under the Life Long Learning Programme-Leonardo da Vinci Programme, co-funded by the European Union and officially started on the 1st of February 2012. SONETOR is a transnational project which aims at developing a training platform that will integrate existing social networking applications with modern adult education methodologies and specially produced content and services, in order to assist Cultural Mediators in developing skills and competences through formal and non-formal learning and in applying them during their work with immigrants. In the website you can find useful links to information about the subject and the aims of SONETOR project, as well as the training platform itself. If you work or are interested in the field of Cultural Mediation, through the platform, you will receive training in issues related to the role and activities of the Cultural Mediators. The training scenarios in the platform are set in fields such as Health, Education, Legal Support, and Public Services. Through other social media in the platform you will have the ability to explore and learn from the experience of others working in the field through their recorded experience and views of other cultural mediators. You will also be able to post your experience and issues and receive the views of other professionals in the field on the issues you raise. What opportunities does the training platform provide and in what way can I contribute? Through the platform and the use social networking software tools (blog, forum, Facebook, Linkedin, Youtube etc) you will have the ability to communicate with other cultural mediators on a national as well as a European level and share good practices or solutions to everyday problems you have faced. In the platform you will have the chance to be informed regarding interesting news and developments in the field of cultural mediation. The rich static and dynamic platform material that will constitute a bank of knowledge on intercultural issues will afford you the opportunity of both being informed and through your active participation informing others thus enriching the material available to all. Through the training available on the SONETOR platform such as the unguided and guided scenarios you will have the ability to enhance your knowledge, skills and competencies in the field of Cultural Mediation. Through the dynamic interaction and continuous communication environment created by the platform learners will be provided with access to a continually available channel of peer learning free of space and time commitments. Through a system of proof of learning achieved you will have the possibility to have your learning accepted by accrediting authorities. The cultural mediation capitulary is reinforced.